BUCYRUS – Student recognition was a main point of focus during the regular meeting of the Bucyrus City School District Board of Education Feb. 23. Nearly 20 students were recognized for outstanding accomplishments throughout the district. The first group of students recognized were selected to have their artwork on display in the main hallway of the Lincoln Administrative Center. Students receiving commendations included: Nash Rose, Kaylee Mason, Trinity Amos, Abbygail Stewart, Taryn Zeigler, Emmelia Bloomfield, Samantha Chase, Riley Moody, Braiden Cross-Garverick and Cassie Robinette. Nash Rose received a second commendation for his artwork on the 2016 Bucyrus staff Christmas card. 8th grade students Makyla Ferris and Joseph Rush each received commendations from the board for having their artwork selected for display during the 37th Annual Young People’s Art Exhibition sponsored by the Ohio Art Education Association. 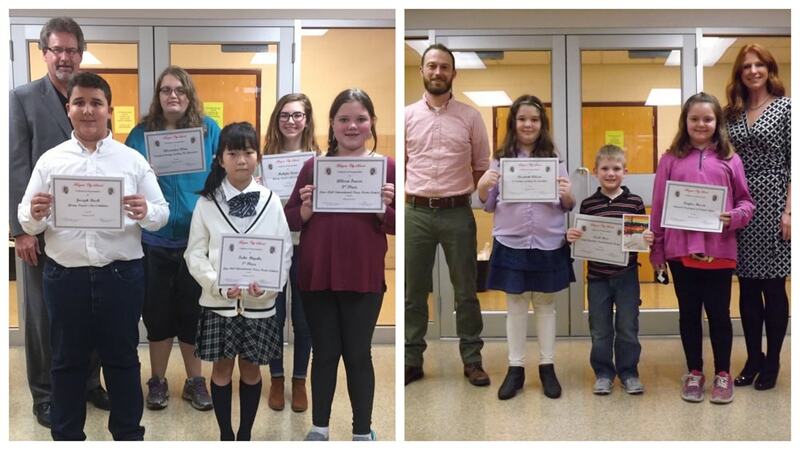 Kaho Miyake (6th Grade, 1st place), Kaitlyn Kuhn (7th Grade 2nd place) and Allison Fraser (6th Grade, 3rd place) were recognized by the Board of Education for their participation in the annual Lions Club International Peace Poster contest. The board approved all items on the agenda, which included accepting the resignation of its longest sitting member, Mr. Douglas Schiefer. Mr. Schiefer has served the Bucyrus community and school district for 13 years. The district will begin accepting letters of interest from community members to fill Mr. Schiefer’s unexpired term beginning Monday, Feb. 27. Those interested should submit their letter and credentials to Bucyrus Treasurer Ryan Cook via email at rcook@bucyrusschools.org. The next regular meeting of the Bucyrus City School District Board of Education will begin at 7:00 p.m. in the Lincoln Administrative Center board room Thursday, March 16.